Rikers Island, 1980s Tax photograph. NYC Municipal Archives. The tumultuous 1970s at Rikers Island described in Part One were just a quiet prelude to the 1980s and 1990s, as a raging crack epidemic and soaring rates of murder and violent crime exacerbated the overcrowding and incendiary conditions on what became the world’s largest penal colony in the 1990s. After its failed 1979 attempt to get rid of Rikers by leasing it to the state for a downstate prison and replacing it with eight smaller jails across the boroughs, the city added nearly 4,000 beds to the complex, bringing capacity to 13,188. But even with the new Anna M. Kross Center and the North Facility aka the Otis Bantum Correctional Center, Rikers remained a pressure cooker on the edge of explosion. Adolescent Reception and Detention Center plan from A Study of Violence and its causes in the New York City Adolescent Reception and Detention Center. NYC Municipal Library. Records at the city’s Municipal Library show that in March 1986, a two-year City Board of Correction report, A Study of Violence and its causes in the New York City Adolescent Reception and Detention Center found the number of violent incidents and injuries in the facility were “far higher” than at other jails on the island. In November 1985, for example, 47 percent of all serious incidents on Rikers involved male adolescents, even though they made up less than 20 percent of the island’s population. The report, which noted that young prisoners are generally harder to control than older ones, said corrections officers wrote an average of 19 reports a day involving serious incidents, including slashings, stabbings, broken bones and the January 12, 1983 fatal stabbing of a 16-year-old boy. It reported that self-inflicted injuries and suicide attempts increased 600 percent between 1983 and 1985 and recommended assigning more experienced officers to deal with the young, violent inmates. Inquiry into Disturbances on Riker Island, October 1986. NYC Municipal Library. The kickoff incident in the rolling riot was a violent altercation involving 30 inmates in the law library at the always tense Adolescent Reception and Detention Center. Four days later, at 8 a.m. on October 13, 150 inmates who had been sentenced to state prison but were still in Rikers because the upstate jails also were overcrowded, barricaded themselves in a dormitory at the Correctional Institution for Men (CIFM) after refusing to stand for the morning count. The inmates took down the barricades after submitting a list of demands to Corrections Department officials that included more services and free time. Officials agreed to most of the demands, even though a search of the dormitory yielded “a number of weapons … and extensive structural damage” inside the dorm. The next day brought a job action by CIFM guards who refused to take their posts for the second shift in anger over concessions to the inmates. Tension boiled over again in a mess hall at 12:46 p.m. on October 17, when an inmate tried to take an extra juice with his lunch. An officer ordered the man to put it back; the inmate threw the juice at the officer. A melee broke out involving dozens of inmates; eleven officers and five inmates were injured. At 11 p.m., on October 18, officers began a planned transfer of 133 inmates on buses from the Anna M. Kross Center to the Correctional Institution for Men. It turned into a violent insurrection, lasting hours. It began when an inmate kicked a guard in the chest, knocking him to the ground. Inmates began yelling and cursing. Mass confusion ensued as some inmates were pulled from buses and reportedly made to run a gauntlet through a double line of baton-swinging officers. Twenty-four inmates were injured, eight seriously with contusions, lacerations and possible broken ribs. Two altercations at the Anna Kross Center quickly followed. 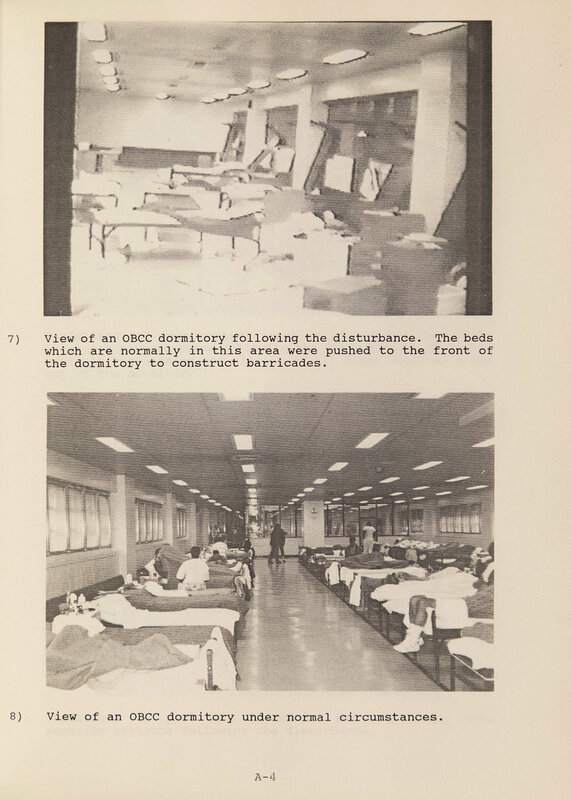 Typical Dormitory, from The Disturbance at the Rikers Island Otis Bantum Correctional Center, August 14, 1990: Its Causes and the Department of Correction Response. NYC Municipal Library. Overcrowding got ever worse as the city’s murder rate climbed steadily, hitting a record high of 2,245 homicides in 1990 and pushing the city’s jail population to 20,000. That year also featured one of the most infamous riots in Rikers Island history. In early August, three inmates beat, stabbed and robbed corrections officer Steven Narby, breaking his jaw, knocking out several teeth and stealing some jewelry. The corrections officers’ union demanded that the inmates be charged with attempted murder. When they were charged only with robbery and assault, hundreds of corrections officers blocked the entrance to the bridge to the island jail in a driving rainstorm, allowing access only to emergency vehicles. The officers, who blockaded the bridge for two days of tense negotiations, also protested the “use of force directive,” which they said limited their response to violent attacks by inmates. The blockade meant hundreds of inmates could not be taken off the island for court appearances, food deliveries were halted causing shortages, jail movements and activities were curtailed, and prisoners were becoming unruly, facing off with officers who had worked more than 40 hours straight. Minutes after a settlement was reached on the blockade, the Otis Banum Correctional Center, which held 905 inmates, erupted in violence. Inmates erected barricades, armed themselves, set fires, flooded sleeping areas and smashed windows. By the time the dust settled, 21 corrections personnel were injured and more than 100 inmates were hurt, 81 seriously. Inmates claimed they were brutalized. Mayor David Dinkins directed the city Department of Investigation to probe the riots. After and before scenes from The Disturbance at the Rikers Island Otis Bantum Correctional Center, August 14, 1990: Its Causes and the Department of Correction Response. NYC Municipal Library. There were periodic disturbances through the 1990s and several suspicious inmate deaths, for which the city paid out $11.8 million in settlements between 2012 and 2016. But through efforts and investments to reform the city’s justice system, crime and murder rates reached historic lows under Mayor Bill de Blasio’s administration, allowing officials to reduce the jail population to about 8,000 and eventually close one facility on Rikers Island. Demands for closing Rikers grew in 2015, after Kalief Browder committed suicide. He had spent more than three years on Rikers Island awaiting trial for stealing backpack at age 16 before the charges were dropped. His family attributed his death to mental and physical abuse he suffered on Rikers. In 2016, then-City Council Speaker Melissa Mark-Viverito created a commission, headed by Jonathan Lippman, the former chief judge of the State Court of Appeals, to study what to do about Rikers Island. In language that was strikingly similar to the 1979 findings, the Lippmann Commission issued a scathing report in early 2017, calling Rikers a “19th century solution to a 21st century problem” and said it must be shuttered and replaced with “something that is more effective and more humane” within 10 years. The commission recommended building smaller jails throughout the city, contingent upon the city reducing the overall jail population to about 5,000. In 2018, Mayor de Blasio announced a plan to replace the facilities on Rikers Island with four community-based jails—one each in Brooklyn, Manhattan, Queens and The Bronx. Hearings began in late March in an approval process that could take seven months. If the plan is approved by the City Council, it would represent a marked moment in New York City’s history. MAC 1928: Model of new penitentiary on Rikers Island “to be completed in 1933.” Photo taken in front of the Blackwell’s Island Prison, ca. 1932. Edwin Levick, NYC Municipal Archives Collection. 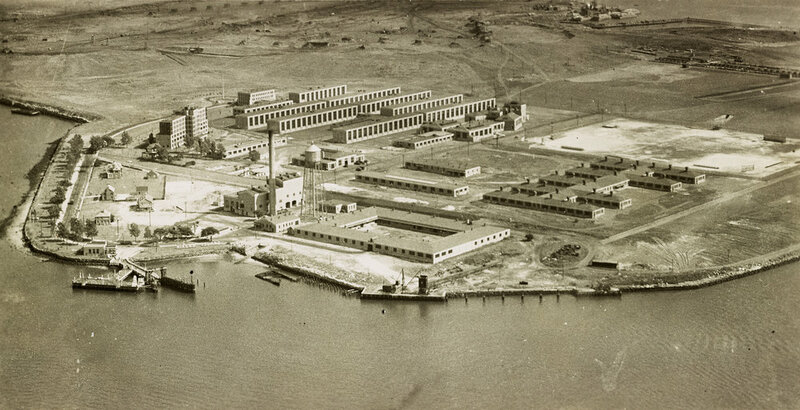 Rikers Island once called—“The City’s Island of the Damned” —was born in tragedy and scandal. Severe overcrowding and a spate of riots and legal battles across the jail’s first 45 years of existence led the city to try to get rid it and replace it with eight smaller detention centers across the boroughs in the late 1970s and 1980s. That highly touted, but controversial effort ultimately failed, and, despite its well-earned notoriety, the 413-acre island jail continued to grow, fester and become increasingly dangerous for the inmates as well as the correctional officers who worked there. Now, 85 years after it officially opened, the city wants to shutter it for once and for all and replace it—again with several smaller jails across Manhattan, Brooklyn, The Bronx and Queens. With that in mind, a trip through the city’s Municipal Archives reveals a harrowing, but by no means complete, tale of how Rikers grew into a sprawling, horrific and riot-torn lockup that once housed over 20,000 inmates—and points to problems the city may once again face trying to close it. Named after Abraham Rycken, whose Dutch family once owned the island, Rikers was home to a military training ground during the Civil War. It was sold to the city for $180,000 in 1884 and became a garbage dump. The city first considered using it as a workhouse. Nothing happened until the late 1920s, when officials announced plans to build a modern jail to replace the crumbling Blackwell’s Island complex of badly deteriorating jails and asylums that had held prisoners and mental patients for over 100 years. Construction of 26 buildings consisting of seven cellblocks for 2,600 inmates, an administration building, receiving center, mess hall, shops, a chapel and homes for the warden and deputy warden began in 1932—and disaster struck almost immediately. On the Friday after Labor Day 1932, the steamboat Observation, ferrying 150 construction workers to the island, exploded in the East River, killing 72 people. Investigations ensued, but construction went on and Rikers Island soon began taking inmates. MAC_1935: Aerial view of unfinished Rikers Island penitentiary buildings, ca. 1936. 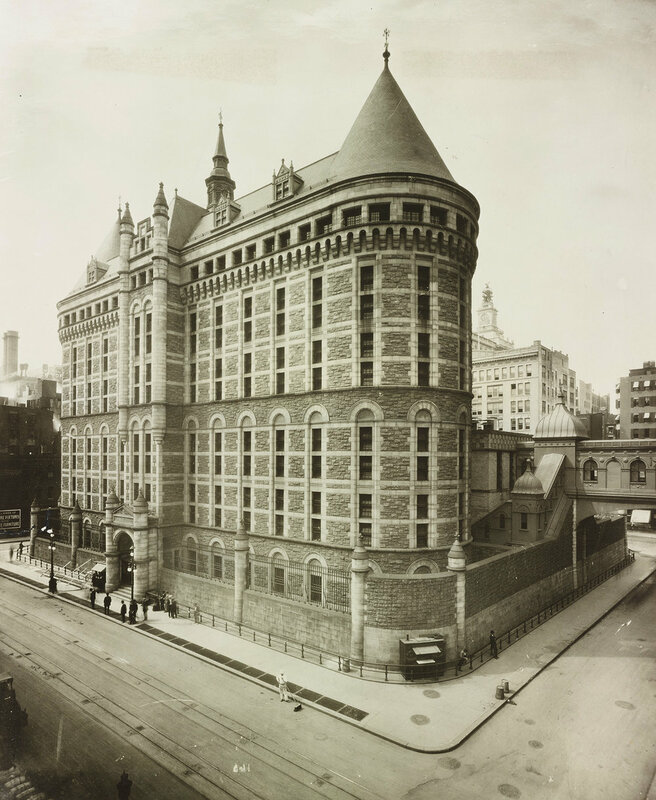 Department of Corrections, NYC Municipal Archives Collection. Scandal quickly followed. In a January 18, 1934, report to Mayor Fiorello La Guardia, the city’s Commission of Accounts found “many irregularities and abuses in the construction of Rikers Island Penitentiary,” largely due to “Tammany Hall Corruption.” For starters, the report noted that the architects had been awarded a no-bid contract and that multi-million-dollar construction contracts have “clearly been violated in a number of particulars with a probable loss to taxpayers of more than $100,000,” or nearly $2 million in today’s dollars. 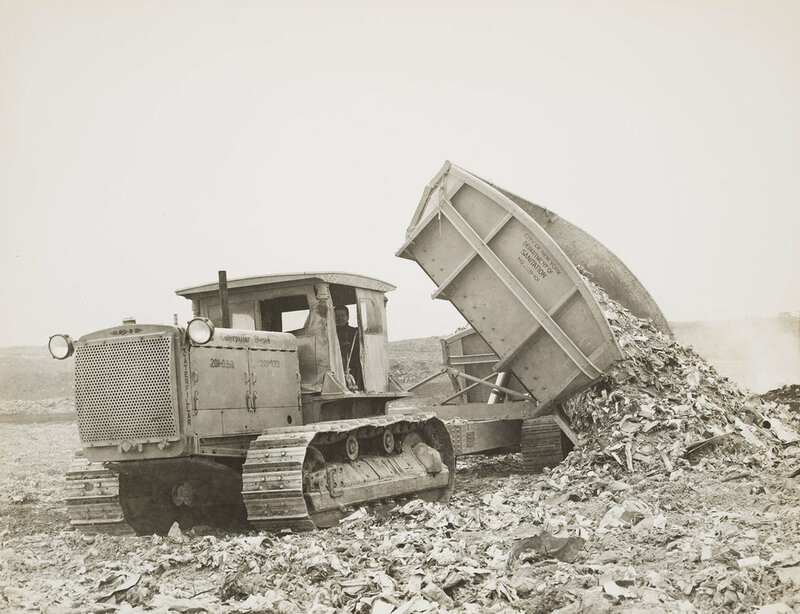 MAC_1058: Department of Sanitation tractor at Rikers Island Dump, ca. 1936. NYC Municipal Archives. Two years later, another report to LaGuardia noted garbage was still being burned on Rikers and critics feared the smoke and stench would make the 1939 World’s Fair in Queens unattractive to visitors. “It is inconceivable that the City of New York can tolerate (this) unsightly and unsavory nuisance,” the report harrumphed. Modifications were made to the garbage-burning process, and the show went on. Despite steady overcrowding—press reports in 1954 show that the city’s jails held 7,900 inmates in spaces designed for 4,200 prisoners—no new buildings were added until the mid-1950s. That’s when additions and alterations were made to buildings housing adults and adolescents to accommodate another 1,900 inmates. 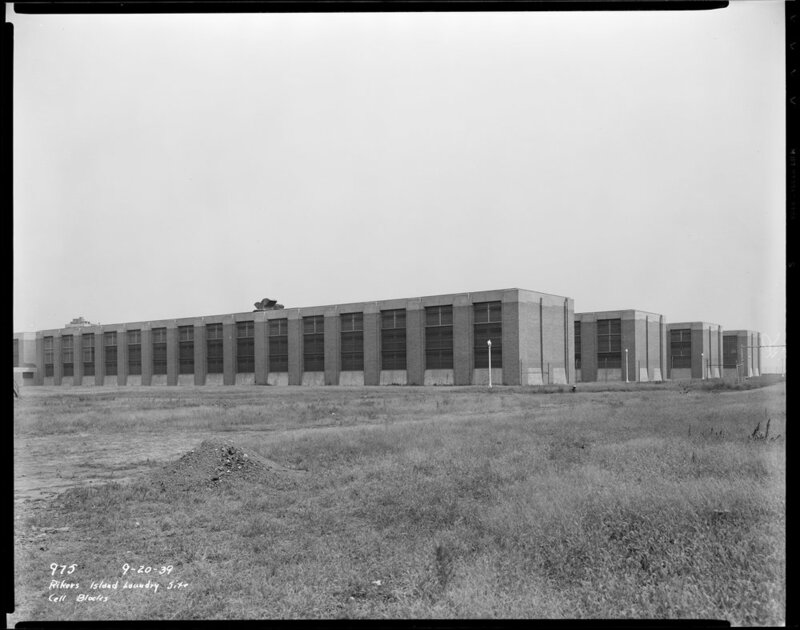 In addition to cellblocks, kitchens and enlarged mess halls, the city built a 107,000-square-foot industrial building to house a new bakery, print shop, shoe shop, garage and diagnostic center. New buildings for adult males, women and adolescents, were added in the mid-1960s and early 1970s. dpw_0975: Rikers Island Laundry Site, cell blocks, September 20, 1939. Joseph Shelderfer, Department of Public Works Collection, NYC Municipal Archives. Still, overcrowding continued to worsen; in 1969, the city held 14,000 prisoners in spaces designed for 8,000. A spiraling crime rate and raging heroin epidemic made conditions so bad in the early 1970s that a headline in the New York Times called Rikers “The City’s Island of the Damned,” and a prescient New York Post story screamed: “Pressure Cooker Ready to Blow at Rikers?” In November 1975, rioting inmates seized two cell blocks at the Men’s House of Detention and 318 inmates were transferred to other buildings as a result. A few days later, 350 corrections officers refused to take their posts during a six-hour protest over budget cuts, overcrowding and inmate violence. dpw_0974 Rikers Island Laundry Site, Chapel Building and Mess Hall, September 20, 1939. Joseph Shelderfer, Department of Public Works Collection, NYC Municipal Archives. At least six lawsuits were filed in Manhattan Federal Court in the early 1970s, alleging inhumane conditions, Draconian rules and policies that the inmates and their lawyers said violated the prisoners’ civil rights. Press reports and archival records show that Federal Judge Morris Lasker found overcrowding and stench in the old Tombs prison and vermin and unsanitary conditions on Rikers Island, where thousands of prisoners waited months for trial, and where an estimated 25 percent of the inmates suffered from mental health problems. The city cited budget restrictions and asked for more time to correct conditions, but Lasker eventually ordered the Tombs closed in 1974; it reopened nearly a decade later after a $42 million makeover. Lasker also found conditions at Rikers and other city jails to be unconstitutional. He ordered the transfers of sentenced inmates to state prisons and told officials to come up with a new classification system, expand visiting hours and allow contact visits. Then city officials came up with a bright idea: Lease the island to the state for $200 million and use the money to build eight smaller city jails in Manhattan, Brooklyn, Queens and The Bronx. Under the proposed 99-year lease, the state would also spend $100 million to upgrade Rikers. eik_08.010.0469: Mayor Edward I. Koch at Rikers Island filming a commercial on gun legislation, August 5, 1980. Mayor Koch Collection, NYC Municipal Archives. An October 1, 1979, report called the Rikers Island Project Working Document explained the original prison building “is now in a decrepit condition which creates a potentially dangerous environment for both staff and inmates,” and noted that 25 percent of the existing buildings were erected in the 1950s and needed “substantial upgrading.” The document estimated the city’s capital costs at $351 million. MAC_1926: “The Tombs” (Men’s House of Detention): Centre to Lafayette Street, Leonard to Franklin Street, ca. 1941. Courtesy of Jail Association Journal, NYC Municipal Archives Collection. But Diane Gordon, of the National Council on Crime and Delinquency, testified that the plan was ill-conceived and would not accomplish its goals. She said the plan would not reduce the jail’s population and urged the board to “develop a more careful plan based on a sounder analysis.” Mary Ann Gangi from the Queens chapter of St. Francis of Assisi said area residents were fearful of increased traffic and a greater risk from hardened state inmates. She vowed that community area residents would “organize and mobilize... to oppose the state takeover of Rikers Island.” Phil Seelig, president of the Correction Officers Benevolent Association, called the hearings a “sham” and refused to even take questions from the board. Opposition from the community and city corrections officers continued to grow and then, in January 1980, a report from the city’s Office of Budget Review showed that the city’s cost estimates for constructing the new jails were way off. The report said the actual capital costs would be upward of $433 million—rather than the $351 million estimate in the Rikers Island Project Working Document and that other costs related to the lease would be as much as $126 million, rather than the Working Document’s estimate of $81.5 million. Rikers Island Dump: Guard on horseback looks at Administration and other buildings across graded area, June 1937. NYC Municipal Archives Collection.